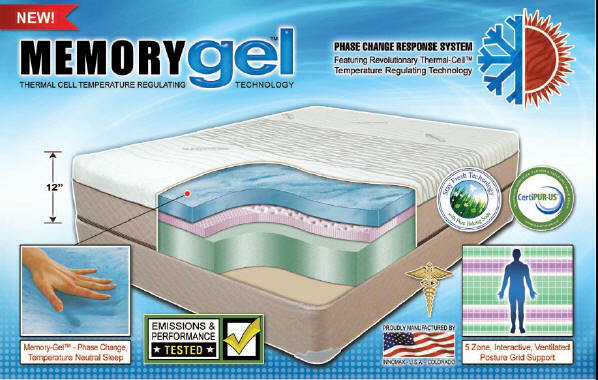 Memory-Gel - Gel infused Memory-Cell® utilizes revolutionary Thermal-Cell™ Temperature Regulating - Phase Change technology. As compression is increased, Gel Infused Memory-Cell® improves thermoconductivity to remove heat efficiently. The unique “Open Cell”, breathable air flow design - supports air and moisture movement creating a cooler night’s sleep, improved blood flow and oxygen exposure to skin cells. Memory-Gel™ - This revolutionary material senses and responds to your body form quicker and improves overall support, giving greater pressure point relief and superior weight distribution. 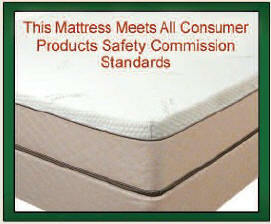 Also Absorbs energy & motion so you and your partner sleep in complete undisturbed, peaceful sleep. Emissions & Performance Tested: Made without BPA, BHT, CFC’s, HCFC’s, PFC’s, PBDE, Phthalate, Formaldehyde, Methylene Chloride, Mercury, Lead, Heavy Metals or Ozone Depleters. 5 Zone, interactive, ventilated posture grid promotes full body support & proper spinal alignment. 3 Zone, Compression Flex Organic Cotton cover provides premium Body Fit & support alignment for maximum pressure relief and comfort. The Ultra-Stretch Organic Cotton cover assists in moisture evaporation & management - for a healthier sleeping environment. Interactive Hi-Response Progressive Support layering for superior pressure reduced support and alignment on all upper and lower extremities. The Memory-Gel™ mattress is proud to be hand crafted entirely in Colorado - U.S.A.
Gel Infused Memory-Touch™ - Superior comfort and quality. A heavier, higher density Memory-Cell® that senses and responds to your body form quicker and cradles your head, neck and back for pressure-free, natural body alignment and comfort. Open Cell breathable air flow design for temperature neutral sleep. Absorbs energy & motion so you and your partner sleep in complete undisturbed, peaceful sleep. 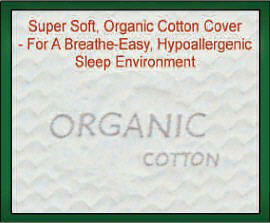 Super soft, Ultra-Stretch Organic Cotton cover - For a breathe-easy, hypoallergenic sleep environment. Optimal Body Balance 5-Zone interactive support grid promotes full body support & proper alignment. Durable Top Enclosure: Encases all the internal components while adding style and beauty in your bedroom. 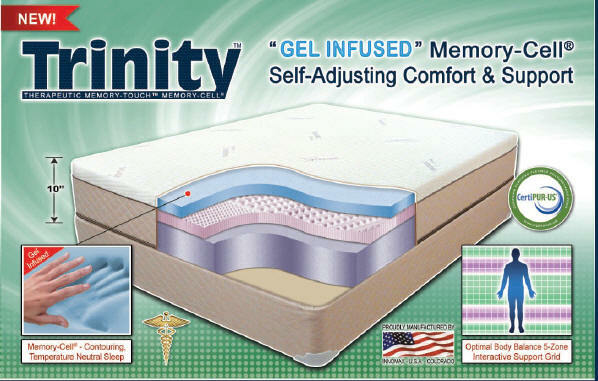 The Trinity™ Memory-Cell® mattress is proud to be hand crafted entirely in Colorado - U.S.A.
Memory-Touch™ - Superior comfort and quality. A heavier, higher density Memory-Cell® that senses and responds to your body form quicker and cradles your head, neck and back for pressure-free, natural body alignment and comfort. Memory-Cell® - This specially formulated, temperature responsive, space-age material contours to the body for even weight distribution and to eliminate pressure points. Open Cell breathable air flow design for temperature neutral sleep. 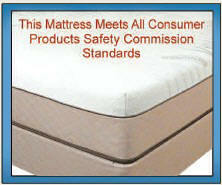 Absorbs energy and motion so you and your partner sleep in complete undisturbed, peaceful sleep. 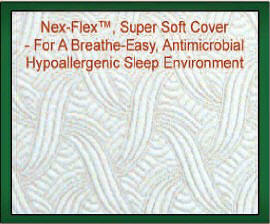 Nex-Flex™ Super soft, Ultra-Stretch cover - For a breathe-easy, antimicrobial, hypoallergenic sleep environment. Great full body support and comfort. Also promotes proper spinal alignment. 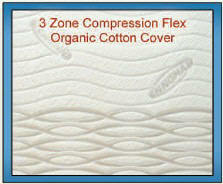 Substrate Base Support Layer - High density, resilient cushioning support. Interactive, heavy duty substrate helps provide full body alignment, proper support & trouble free sleep. 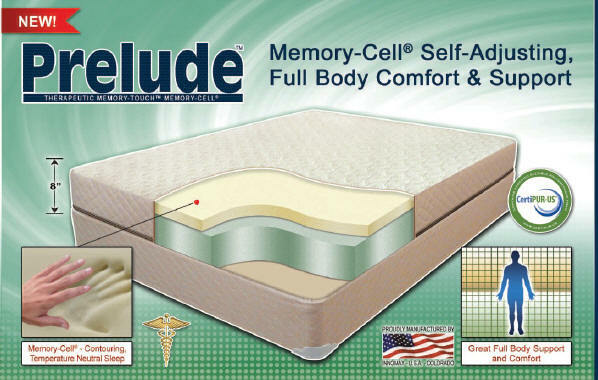 The Prelude™ Memory-Cell® mattress is proud to be hand crafted entirely in Colorado - U.S.A.